The British soldier was a fascinating and complex figure in the century between the Hanoverian accession and the Battle of Waterloo. The ‘war and society’ approach has shed much light on Britain’s frequent experience of conflict in this period, but Britain’s Soldiers argues that it is time to refocus our attention on the humble redcoat himself, and rethink historical approaches to soldiers’ relationship with the society and culture of their day. Using approaches drawn from the histories of the military, gender, art, society, culture and medicine, this volume presents a more rounded picture of the men who served in the various branches of the British armed forces. This period witnessed an unprecedented level of mass mobilisation, yet this was largely achieved through novel forms of military service outside of the regular army. Taking a wide definition of soldiering, this collection examines the part-time and auxiliary forces of the period, as well as looking at the men of the British Army both during their service and once they had been discharged from the army. Chapters here explore the national identity of the soldier, his sense of his rights within systems of military discipline, and his relationships with military hierarchies and honour codes. They also explore the welfare systems available to old and wounded soldiers, and the ways in which soldiers were represented in art and literature. In so doing, this book sheds new light on the processes through which soldiers were ‘made’ during this crucial period of conflict. Notes on the contributors Kevin Linch is a Principal Teaching Fellow in History at the University of Leeds and works on the military in Georgian Britain. His monograph, Britain and Wellington’s Army: Recruitment, Society, and Tradition 1807-15, was published in 2011 and other recent publications include a chapter in Soldiers, Citizens and Civilians: Experiences and Perceptions of the Revolutionary and Napoleonic Wars, 1790-1820. 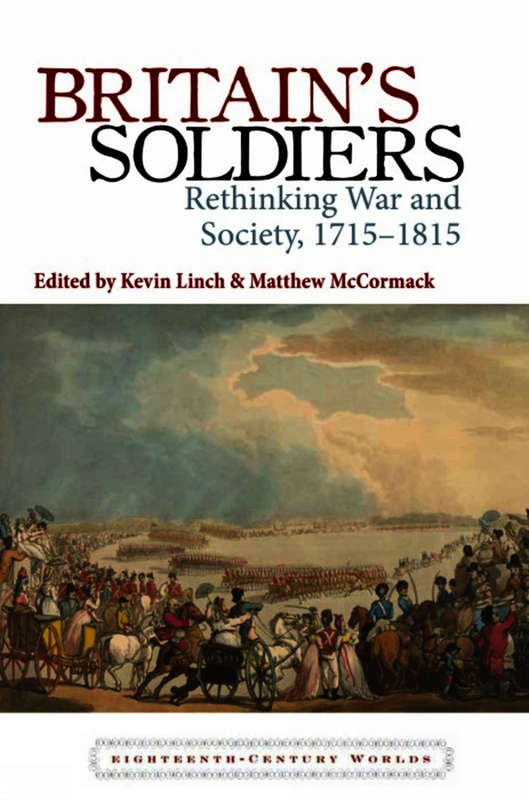 Further contributions are forthcoming in Soldiering in Britain and Ireland, 1750-1850: Men of Arms and Fighting someone else’s war? Transnational mercenaries, adventurers and volunteers in modern conflicts. Matthew McCormack is Senior Lecturer in History at the University of Northampton. He works on Georgian Britain and has published widely on the role of masculinity in politics and warfare. He has published articles in British Journal for Eighteenth-Century Studies, The Historical Journal, Gender & History and Cultural & Social History, and has also contributed chapters to a number of edited collections. His monograph The Independent Man: Citizenship and Gender Politics in Georgian England was reissued in paperback in 2012, and he edited the collection Public Men: Masculinity and Politics in Modern Britain for Palgrave. Ilya Berkovich completed his MA at the Hebrew University of Jerusalem before moving to Peterhouse, Cambridge, where he was a recipient of a research studentship. He is currently working toward the completion of his Ph.D. thesis entitled 'Motivation in Armies of Old Regime Europe'. It is a comparative study based primarily on the personal recollections of over one hundred individual common soldiers who served in a number of eighteenth-century armies. Louise Carter is Lecturer in History at University Campus Suffolk. She gained her PhD from the University of Cambridge and her research interests are in war, gender and empire in the eighteenth and nineteenth centuries. She has published in Gender & History and is currently working on a monograph. Bruce Collins, Professor of Modern History at Sheffield Hallam University, has published widely on mid-nineteenth century America, including The Origins of America's Civil War (1981). More recently, he has been working on British power-projection from the 1780s to 1902 and has published 'Siege Warfare in the Age of Wellington' in Wellington Studies IV (2008) and War and Empire: The Expansion of Britain 1790-1830 (Longman Pearson, 2010). Stephen Conway is a professor of history at University College London. His publications include The War of American Independence, 1775-1783 (1995); The British Isles and the War of American Independence (2000); War, State, and Society in Mid-Eighteenth-Century Britain and Ireland (2006); and Britain, Ireland, and Continental Europe in the Eighteenth Century: Similarities, Connections, Identities (2011). Graciela Iglesias Rogers is a journalist and historian, who was recently awarded her DPhil from the University of Oxford, entitled ‘British Liberators: The Role of Spanish Forces in the Peninsular War (1808-1814)’. She is a research assistant on the project ‘Re-imagining Democracy in Europe and the Americas from 1750 to 1860’. Caroline Louise Nielsen is currently working on a PhD in Historical Studies at the University of Newcastle, where she also teaches. This project is entitled ‘The Chelsea Out-Pensioners: Image and Reality in Eighteenth-Century Social Care’ and is funded by the Arts and Humanities Research Council. Cicely Robinson completed a BA and MA in History of Art at the University of Bristol. She is now part way through an AHRC funded collaborative PhD in History of Art with the University of York and the National Maritime Museum. Entitled ‘The National Gallery of Naval Art, Greenwich Hospital’, this research project investigates the display and reception of martial portraiture and action painting within Britain’s first ‘national’ gallery, founded in 1823. William P. Tatum III hails from North Carolina, received his BA in History and Anthropology from the College of William & Mary in 2003 and his MA in History from Brown University in 2004. He is completing his PhD at Brown and serving as the Sol Feinstone Scholar at the David Library of the American Revolution. His dissertation examines the eighteenth-century British military justice system as a civilian-influenced imperial institution. Dr Kevin Linch is Principal Teaching Fellow at the University of Leeds. Dr Matthew McCormack is Senior Lecturer in History at the University of Northampton.